Potatoes are America’s most popular vegetable. According to the United States Potato Board, the average American eats an average of 125 pounds of potatoes every year. Potatoes are an excellent source of energy, and with more potassium than even bananas as well as being fat free, the potato is a healthy staple in any diet. Potatoes can be part of any home garden, although care must be taken when planting potatoes to ensure the tuber is planted at the right depth. Potatoes grow best when the soil surface temperature is between 60 to 70 degrees Fahrenheit. Too hot, and the tuber will not form. Light frosts will not harm the tubers, but strong and deep freezes can stop growth completely. Potatoes need well-drained and well-fertilized soil to achieve maximum growth. Planting depth varies from 1 to 6 inches below the surrounding soil level. Potatoes will emerge faster with shallow planting. For growers eager for a quicker harvest, shallow planting, along with tedious care, might be the way to go. Some planters use what is called a straw method. Plant potatoes just below or at surface level and keep them covered with 4 to 6 inches of straw throughout the growing season. 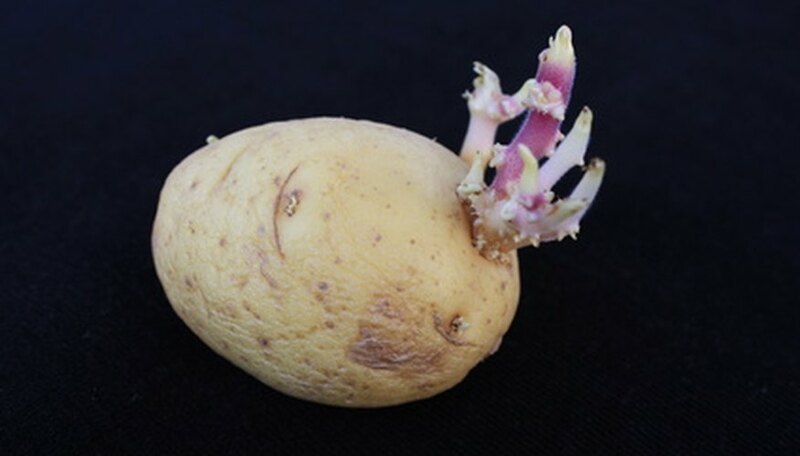 Although shallow planting will result in a quicker yield, shallow planting can also cause the actual potato tuber to set closer to the surface of the earth and be subjected to sungreening. Sungreening is a condition where the potato develops a green cast if it grows too close to the surface. These green potatoes can be poisonous and should not be eaten. Potatoes can be planted in a furrow with a depth of 6 inches, covered with a minimum of 2 inches of soil. A minimum of 8 inches of well-drained and cultivated material should be underneath the planting to ensure that the tuber does not sit in liquid. Deep planting, or even shallow planting in deep furrows, can be hazardous in heavy, wet soils, which can lead to rot and bacterial infection. Always ensure the surrounding material is well-drained, sandy loam. According to Oregon State University, potatoes require good drainage due to “high tuber susceptibility to disease-causing bacteria and fungi.” Do not use tines to harvest potatoes, as metal spikes can penetrate the skin, leaving the vegetable susceptible to rot. To avoid potato scab, ensure soil pH is between 5.2 to 5.5. Rochelle French has been a writer and editor since 1994, providing services for businesses, novelists, and publishers. Her articles can be found on eHow.com and GardenGuides.com. She holds a Bachelor of Arts degree in history from University of California, Davis and is a published author of six pseudonymous novels. What Vegetables Can I Plant in September?